I agree. I am also not sure whether the template's author posted the video; at times, it seems like he is complaining about the fit of the pieces. But it is hard to understand whether he is saying "I should have made this better", or "he (the actual author) should have made this better", when all you get is "this doesn't fit!?!" I basically went through the videos, taking screenshots whenever I saw a part being used whose purpose wasn't immediately clear from the template. 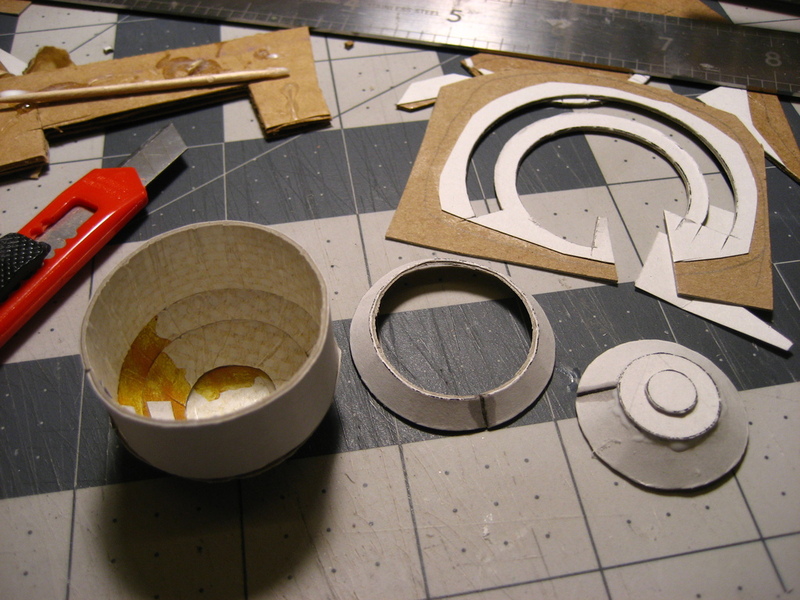 That also organized the construction sequence in my head, keeping in mind that I am changing the build slightly. I have already found a bunch of places where the model is inaccurate. I'm documenting these (and the fixes I can come up with) as I go. I'll put them in the thread fwiw. This is the first problem I've run into: the bulking on the hull sidewalls is off. To illustrate, here is a frontal view of the model. So we are looking at the port side hull. 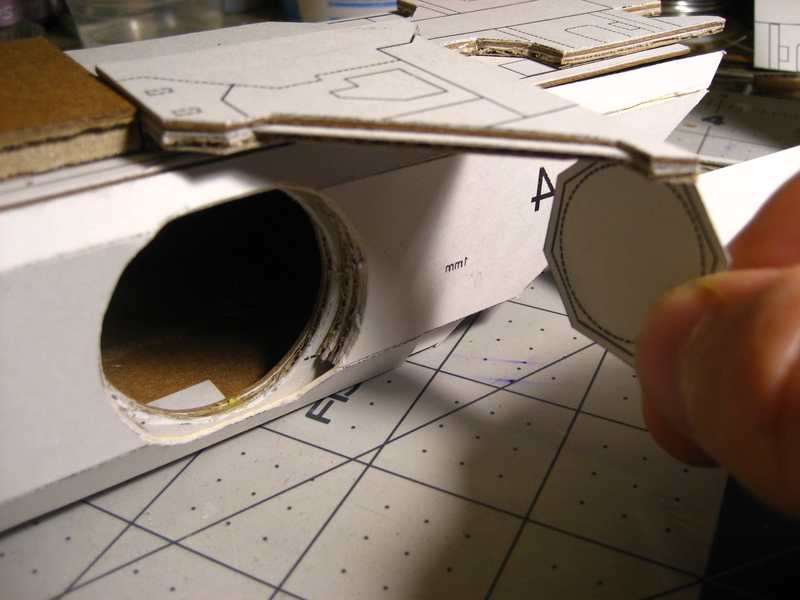 The template specifies 4 layers on top of the basic box hull. These are marked on the plans as 1 thru 4. 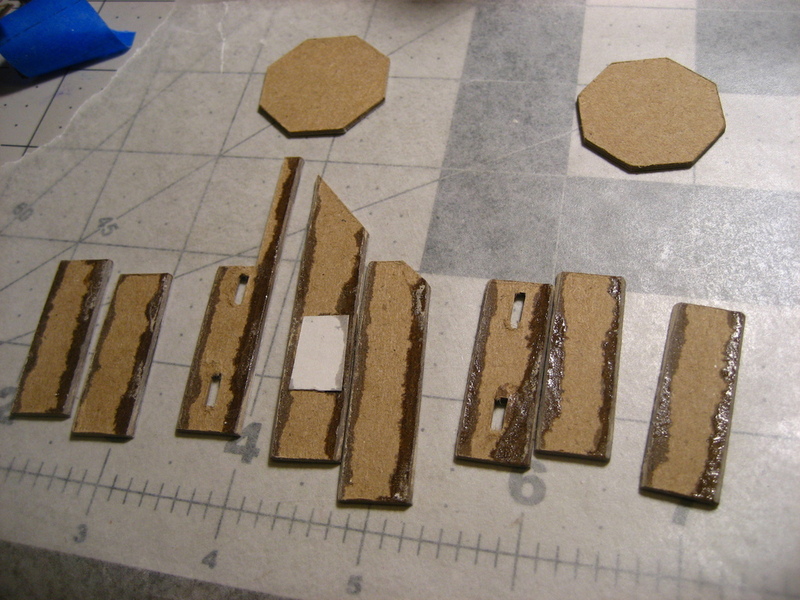 According to the plan, they should be 2mm thick each, except for the last layer which should be 1mm thick. 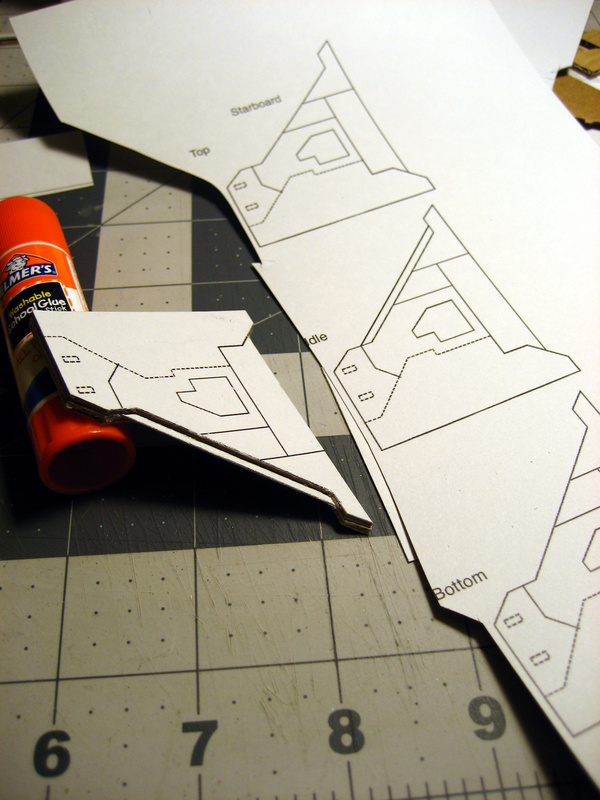 (Keep in mind I use combinations of materials to form the thicknesses required, and still keep the template pattern visible for cutting purposes). As you can see, the 4th layer has folds that need to fold down to meet the 1st layer, however the 2nd layer is in the way, so it is not a flush finish. To remedy this, I had to cut the edge of layer #2 at an angle, this can be seen in the next photo (starboard side hull). Now the hull can be glued together properly. The same needs to be done for the bottom join of the 4th layer. Note: there is a 5th layer (marked 5-1 and 5-2 on the template) which is more of a decorative rather than a structural layer. This looks like it won't cause problems yet. This is the second problem I've encountered: the wingroots are too short, and the piece connecting the engines to the hull is too narrow. 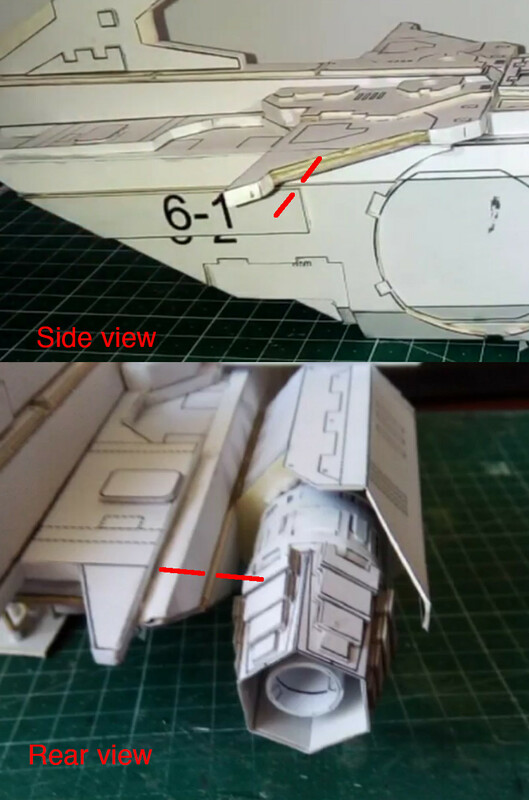 To be fair on the template's author, it is hard to tell that there actually is a connecting piece in the first place, because the finished model is very busy in that section, with lots of detail on top, and the landing pad boxes at the bottom. 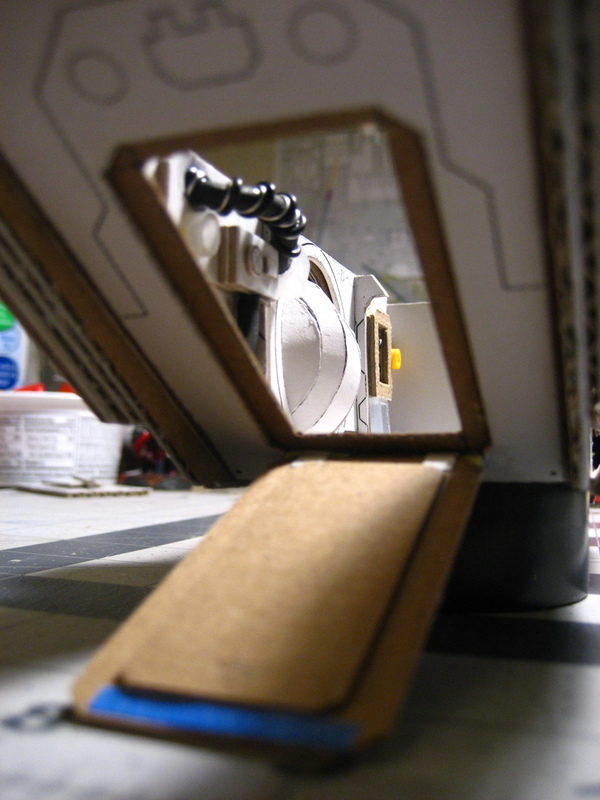 A direct front view doesn't show it either, because the ball turrets are in the way. 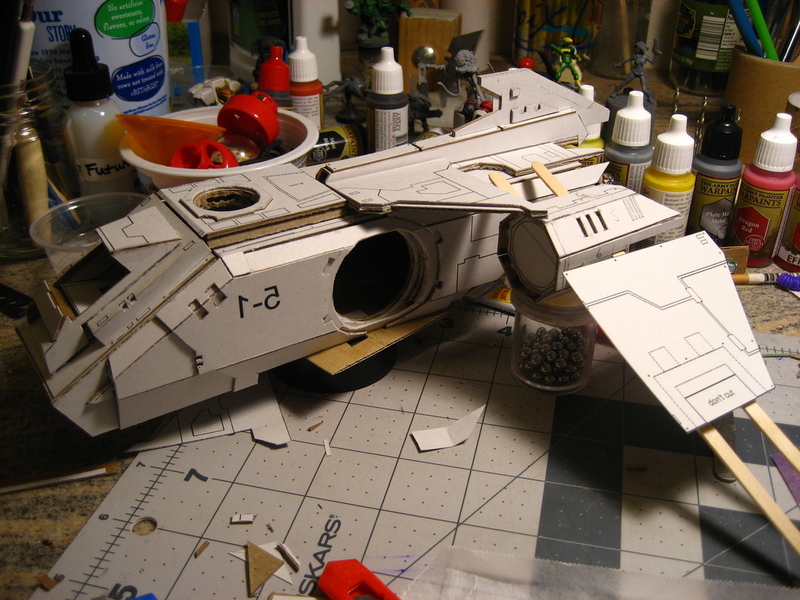 Luckily this model is infamous in that it is one of the harder Forgeworld models to put together, requiring a lot of straightening of parts, so there is a bunch of assembly howto's posted on the web, showing the model in various stages of construction. 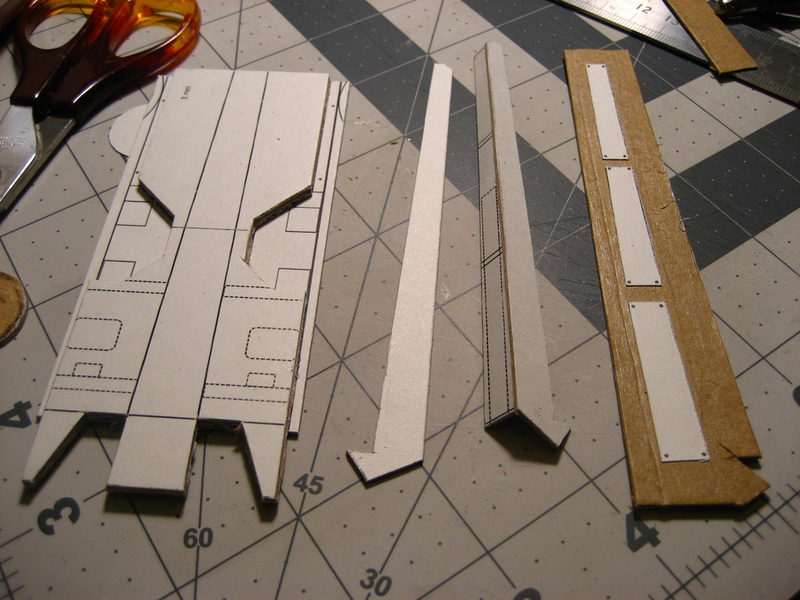 Next, compare these screen shots from the model's assembly video, which show that although there is a piece (labeled 6-1 on the template), it is not stated that this piece has any appreciable thickness, so when the model is put together, there is almost no separation between the engine and the main hull. 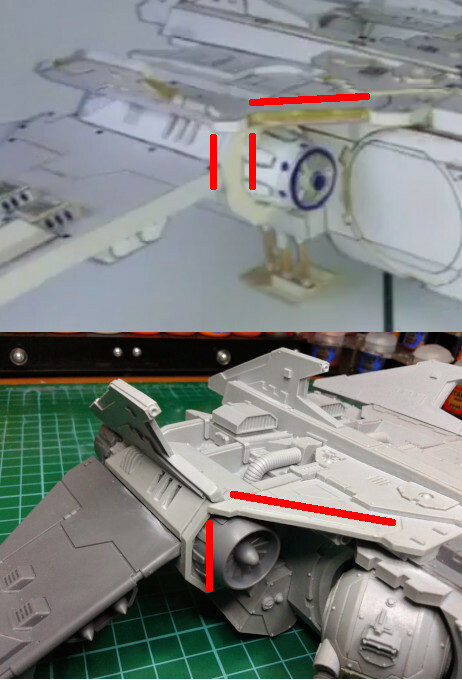 This also means that the engine tucks under the wingroot, whereas on the original model the engine clearly sticks out from underneath the wingroot. The wingroot is also clearly too short / narrow. To fix this I've taken the wingroot template and stretched the leading edge a tad. 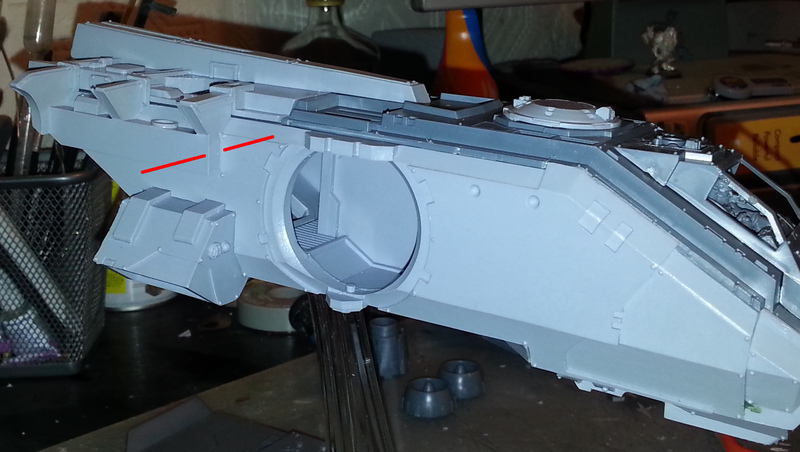 This gives a but more clearance (in width as well as length) between the engine intake and the eventual ball turret. It may be a tad too much, so I'll see how I go. Working on the tail. 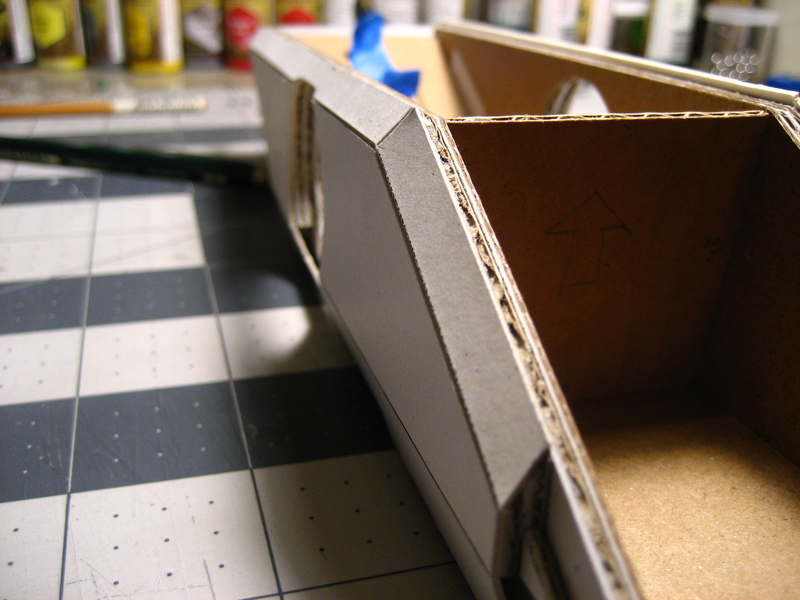 I'm making all of these structures out of layers of thick chipboard. 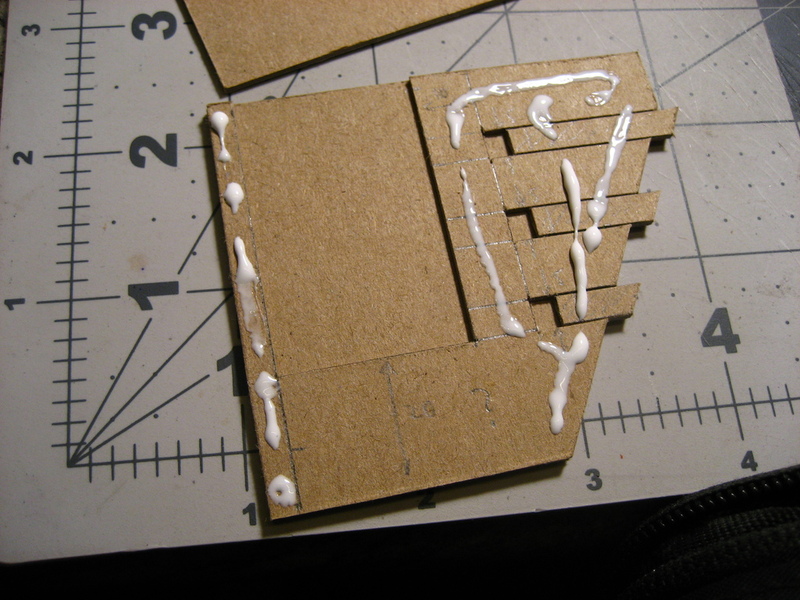 I will most likely end up chopping this section in half, to give me a removable roof on the model. Tackled the port engine housing tonight. This is another little problematic piece. It is basically a octagonal tube, but the length of the octagon caps (front and back) have side edges of about 12mm (so a circumference of 96mm), while the wall sections are all about 12.75mm wide (so a total of 102mm). Not sure why this is so, since the way I would score the wall sections would be on the outside edges, so the inner circumference would be equal to the disk I will use as a cap. So what I ended up doing was to split the walls into separate sections, flood the edges with super glue, and then sand the edges back. 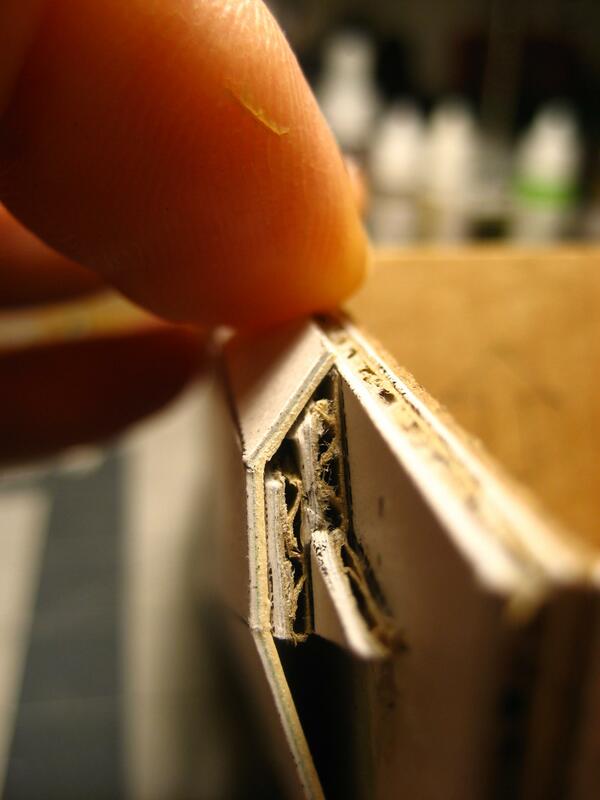 I know, sounds like the last thing anyone sane would do, but there is a rationale: the front cap is recessed into the body of the engine, and the walls of the engine is quite thick (being heavily armored and all), so I made the entire thing out of 1.5mm chipboard. Trimming these pieces by 0.75mm symmetrically is easier done with sandpaper than a knife, plus I get a beveled edge so the outside diameter maintains its 102mm circumference. Maybe that is what the author intended? Note the four small extra slits I cut into two of the sections. I'll be running wooden stirring sticks through these to support the wings, since they will be pretty heavy with armament and VTOL fans, and the joining surface is very narrow, so it will most likely otherwise be a point of failure. 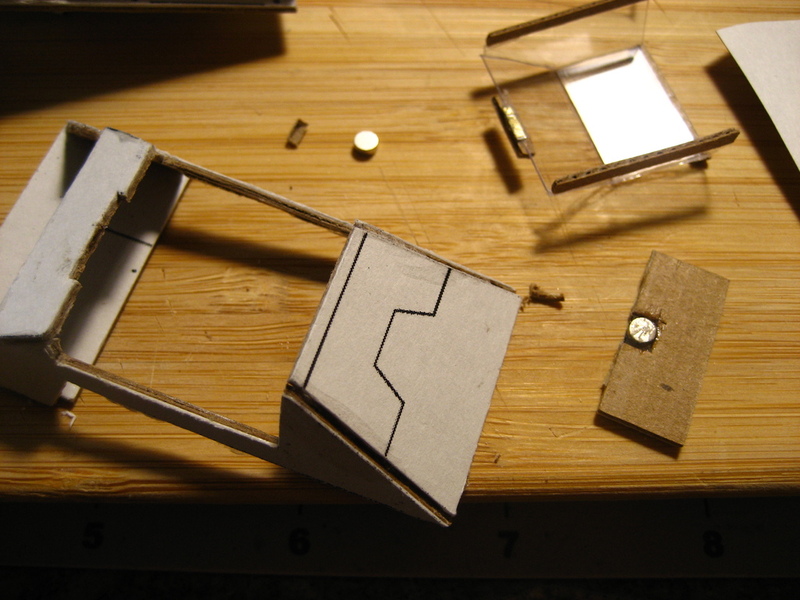 You can see the two stirrers inserted through the slits, supporting the shape of the (to be completed) wing. 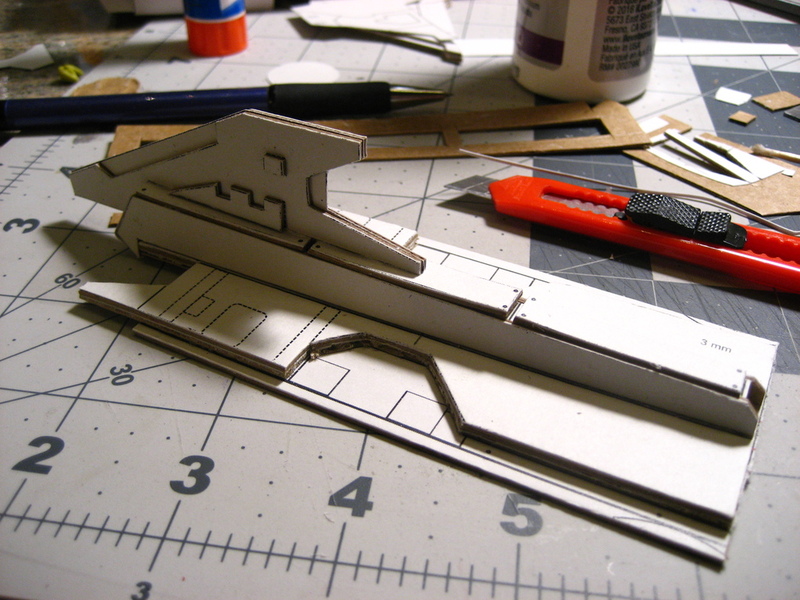 Also the top hatch has been cut out, and the last of the side plating has been added to the port hull. Considering all the clever workarounds you've had to come up with, the model looks fantastic. I would have gotten frustrated much earlier in the build and might not have continued - especially since Pataroch has designed a Fire Raptor, albeit a less detailed one. And from watching the assembly videos I definitely knew what I was getting myself into. However, I am not really complaining, just noting these things down for anyone else who wants to build this. The template as-is is a pretty good base to work from, it is in general accurate enough. Just tweaks, and documenting them as I go along. 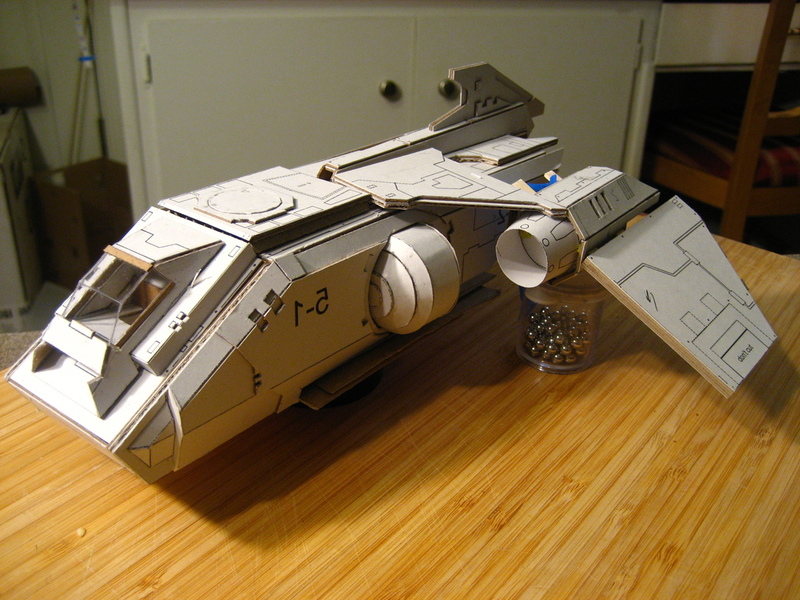 Took some first steps on the port wing and the port ball turret. 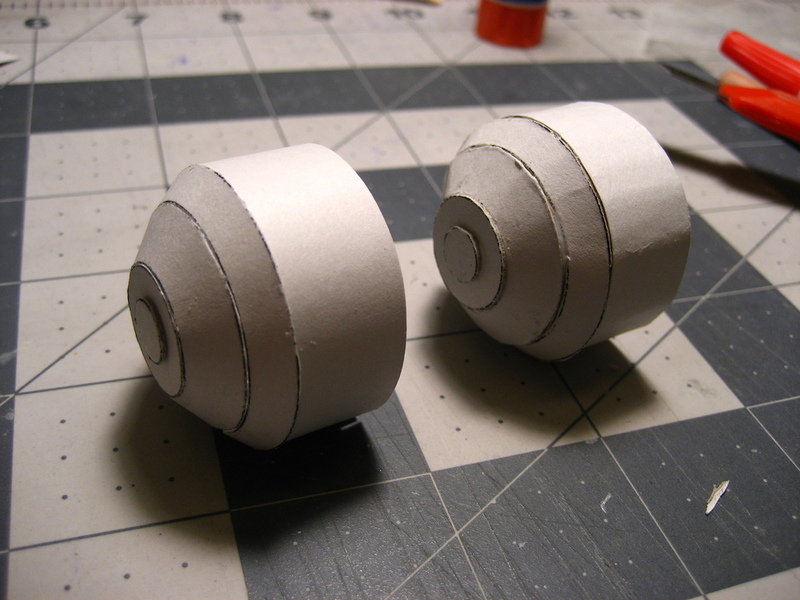 I made two half-balls to start with, one is made from index card, the other from index card glued to cereal box card. 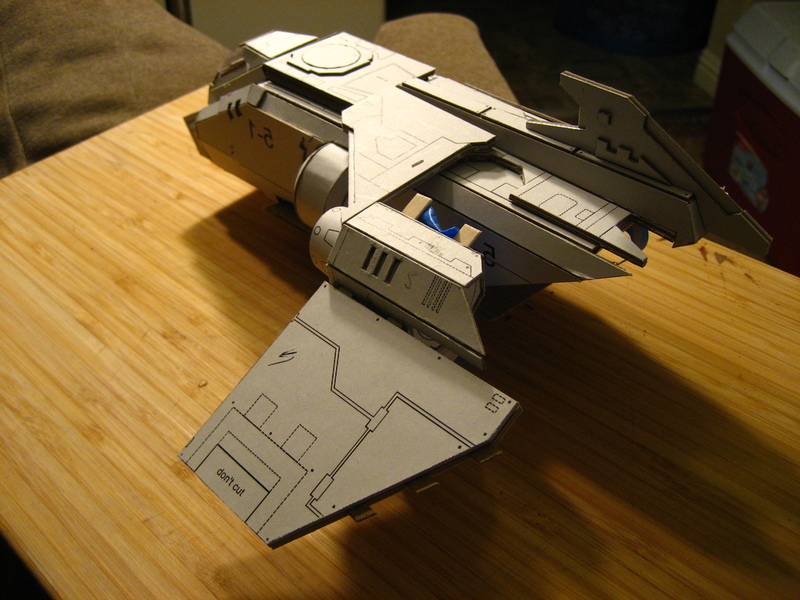 At first cut the index card version is definitely cleaner, but I'm going to stick with the thicker one, since I need it to be strong enough to carry the gunner, and it needs to be swivel mounted so the guns can move. Next I worked on the port wing. 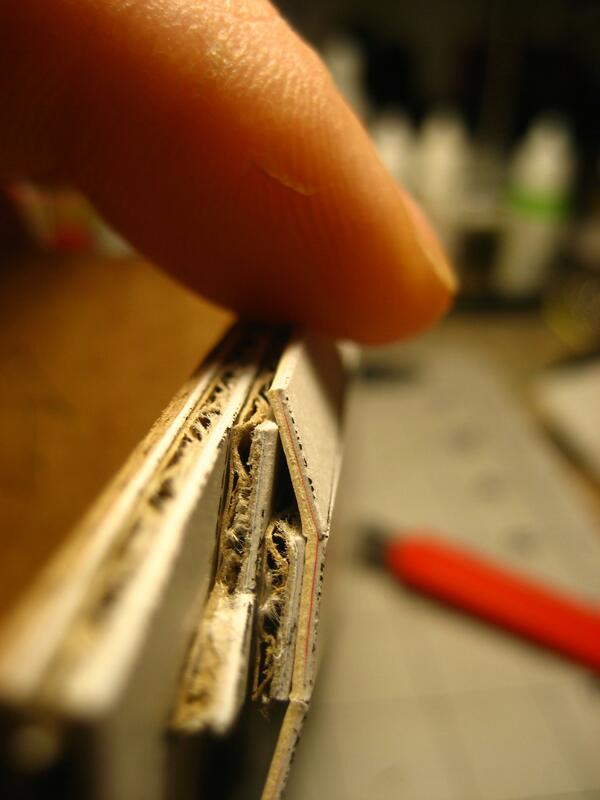 I'm sandwiching three pieces of chipboard together. 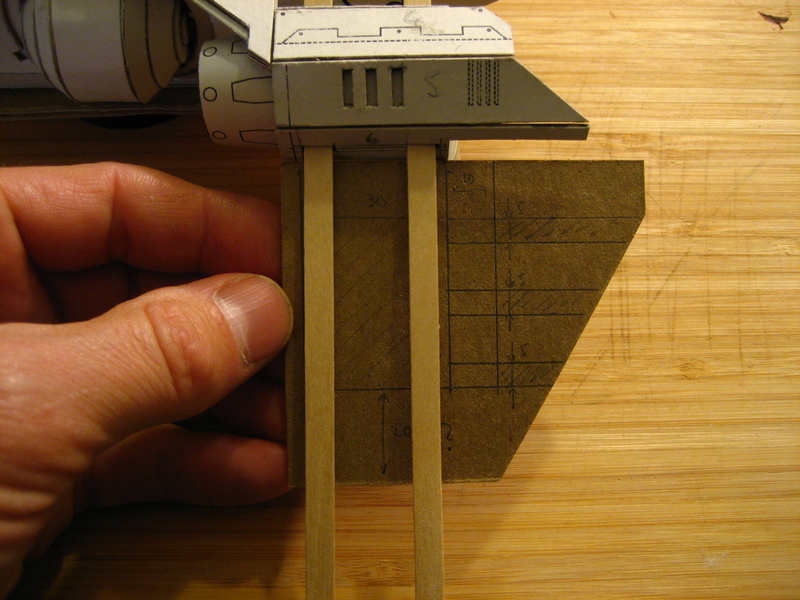 The middle layer is there to provide space for the wing spars / stirring sticks, plus it provides a chance to add some extra detail to the wing structure. 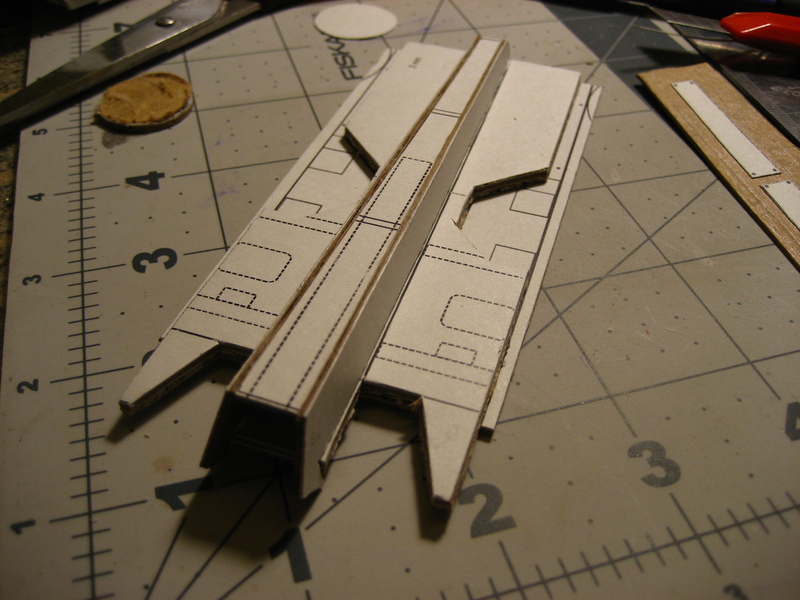 And here is the current mockup of the aircraft. 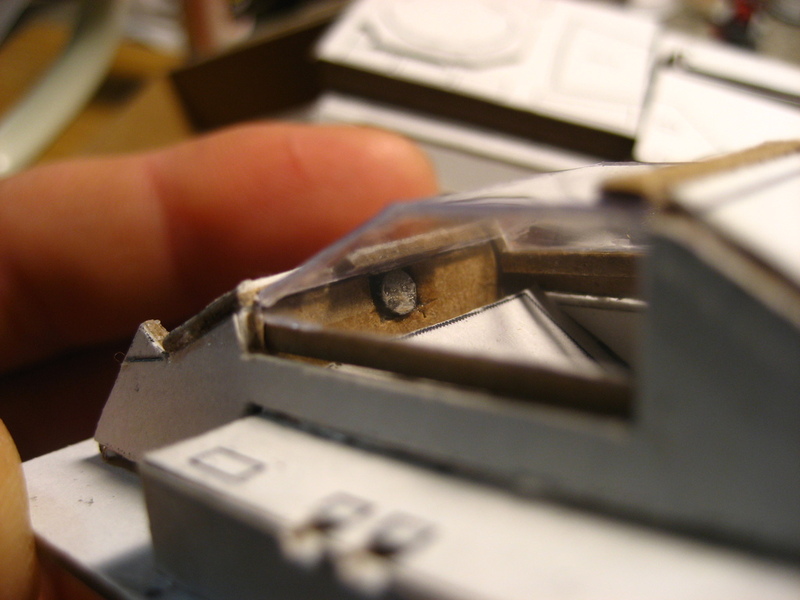 Almost nothing is glued together: the cockpit and canopy are two (actually three) pieces, the top surface of the main hull is two pieces (soon to be three), and the engine is only loosely attached to the wing. This helps me check the layout before comitting. The wing fits nicely onto the spars, so I am considering keeping it that way so that I can easily detach the wings in case I want to transport the model. It's really looking good. Great photo documentation of your process. I embedded a sliver of metal into the canopy, and a small magnet in the cockpit frame. So this makes the canopy removable. Still needs cleanup, but it works well. 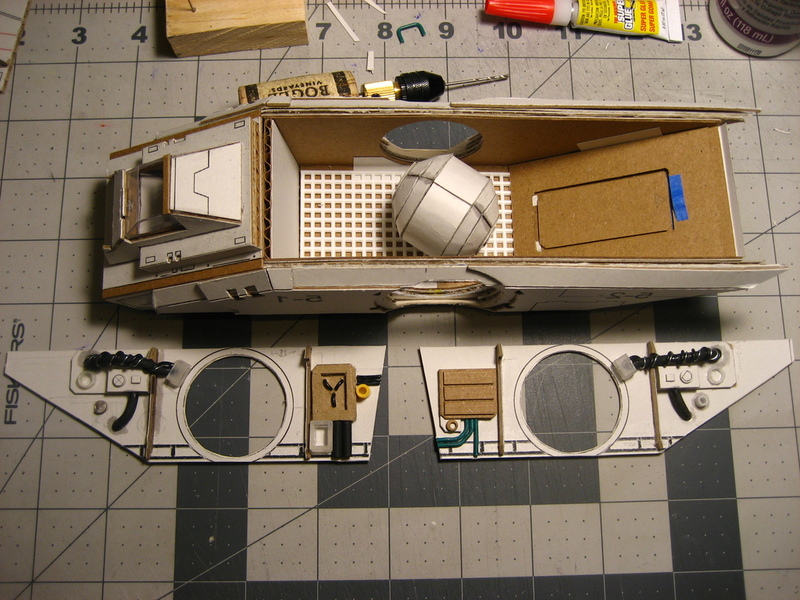 Then I started work on the interior. 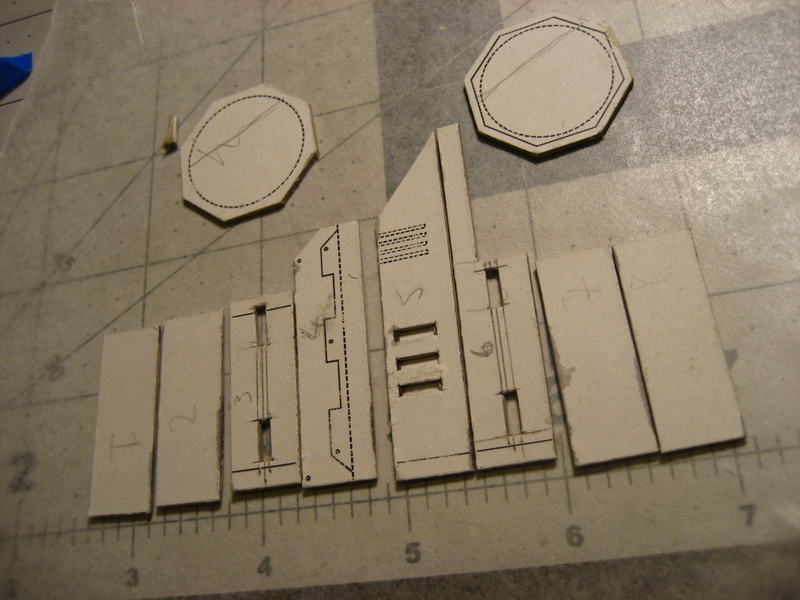 Basically, I used two templates onto which I greeble. Still needs a bit of work, there is too much empty space. 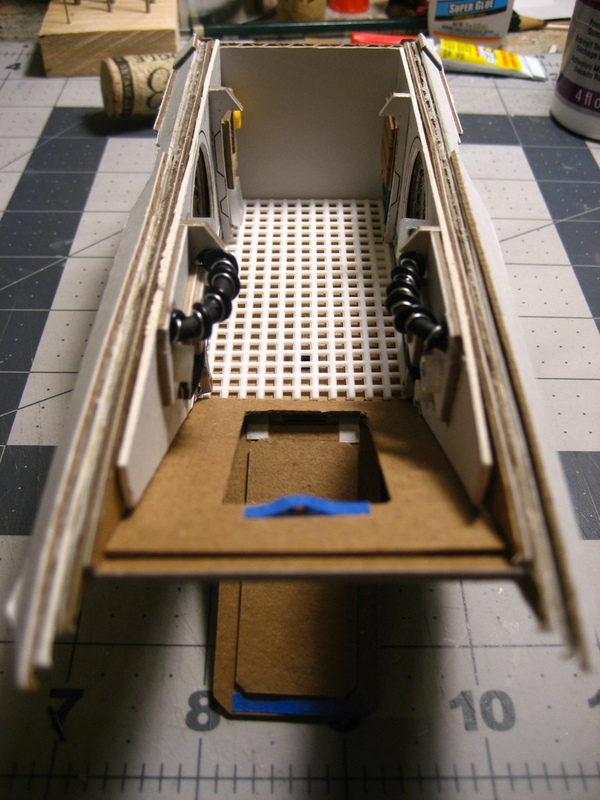 The ceiling will also get some pipes running along it, and the far wall (behind the cockpit) will a couple of rungs that form a ladder, plus maybe another control panel.